Potato cakes or potato scallops – whichever name you know them by, they’re a delicious part of Australian cuisine and easily my favourite thing from a fish and chip shop. I was talking to a friend who is home in Australia on Skype a little while ago and fish and chips came up. From there, my mind went straight to potato cakes. Yum… it’s amazing how something as simple as a potato cake isn’t available in America, even in their fish and chip shops, which are few and far between – it’s the little things like that that just reinforce that you’re in a completely different country, more so than driving on the other side of the road does. 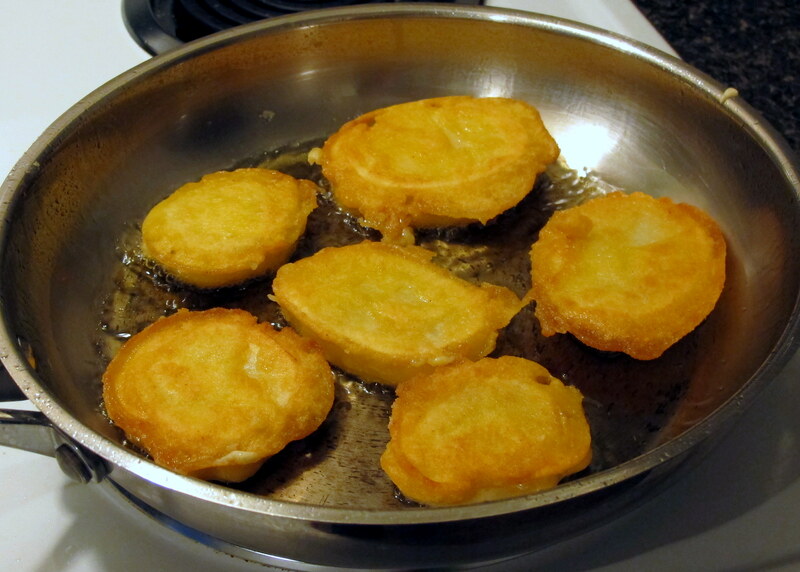 Anyway, after that, I decided that I would need to add potato cakes to my Aussie food repertoire. From some extensive online research (he he he), there’s two schools of thought when it comes to making potato cakes. Slice and boil: slice the potatoes on an angle into rounds (ovals, really) and boil before battering and frying. I like this method for a couple of reasons; it cuts out a lot of time and since the potato cakes are slices of potato, they hold up to being handled better than the mashing method. The one downside is their smaller size… but you can have more than one. Potatoes are low in FODMAPs. Make sure the GF plain flour blend you use contains grains that you can tolerate. Corn meal is low in FODMAPs but some cannot tolerate it for other reasons. If you use any dried spices in the batter, make sure they don’t have onion or garlic powder in them. 3 large russet potatoes – or any kind that is large enough to create a decently sized cake. 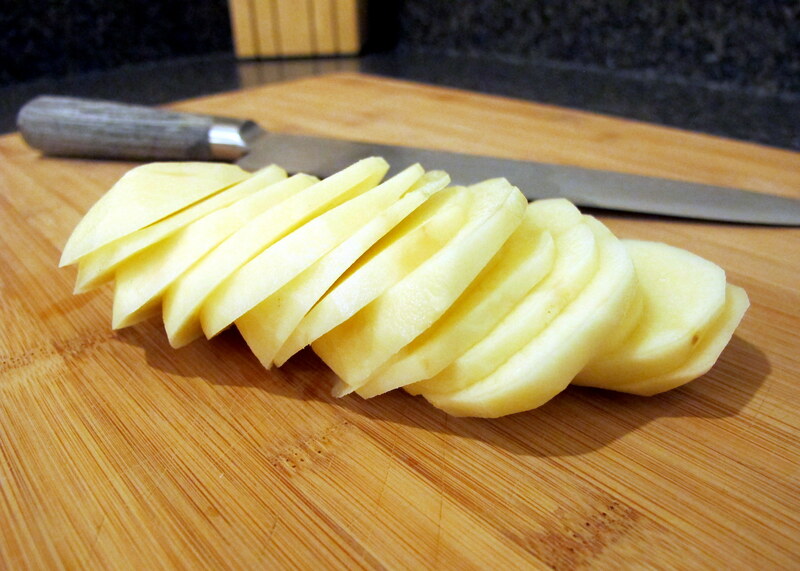 Slice the potatoes – on an angle so the slices are a little bigger – into ovals that are around 7-10 mm thick. 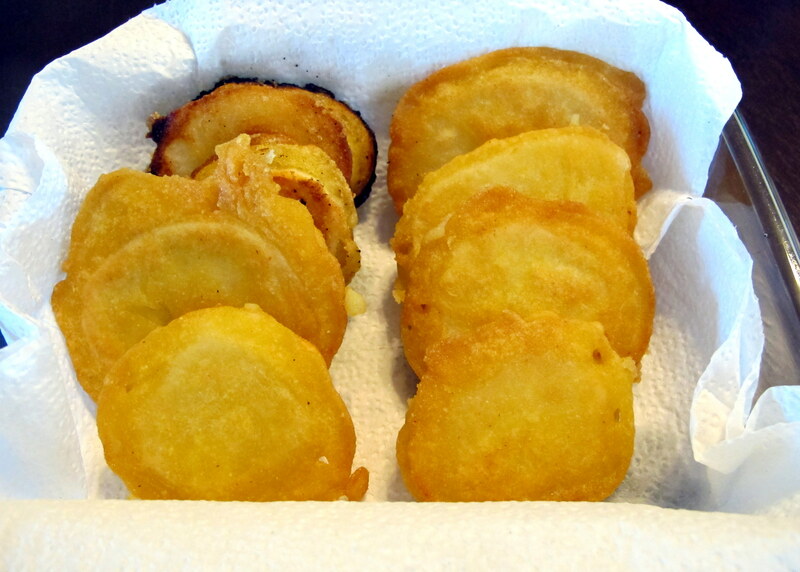 You can see in the photo below that I cut them into thinner slices – I was trying to test the difference between one thick slice in batter or multiple thin slices frozen together and then battered. Result: there is no textural difference but the single slice is easier to eat because the cake won’t split at the join. Place them in a pot of boiling water and boil for 2-3 minutes. Drain and lay out to cool. While they cool, mix all the batter ingredients together until it is smooth. It should be like a thick paste. Refrigerate it until the potatoes have cooled enough to handle. Lay out a chopping board that will fit into your freezer and place a sheet of wax paper on top. 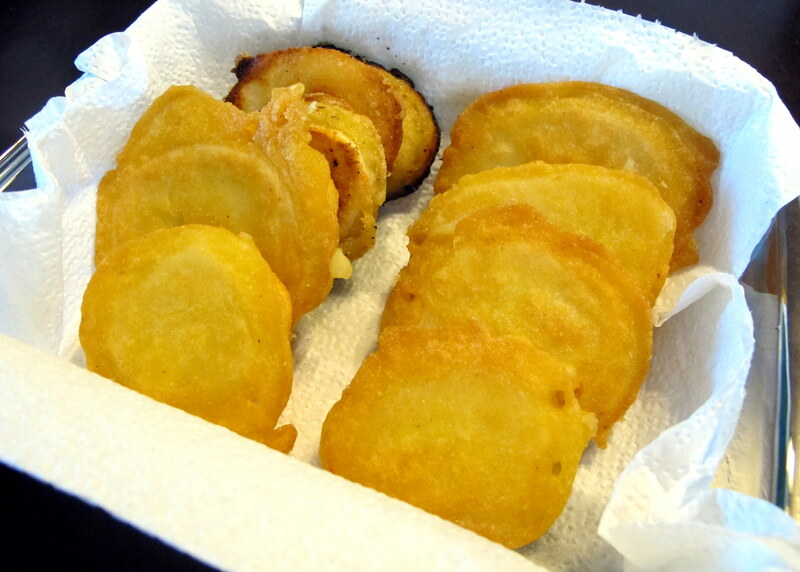 Dip each of the potato slices into the batter, let the excess drip off and then put them on the board. Once the all the slices are covered, freeze them for at least an hour. This will solidify the batter and make them easier to fry later on. The less water that can mix with the oil, the less splattering you’ll experience. With my unfrozen batch, I got hit in the forehead, so yeah, the oil can jump. 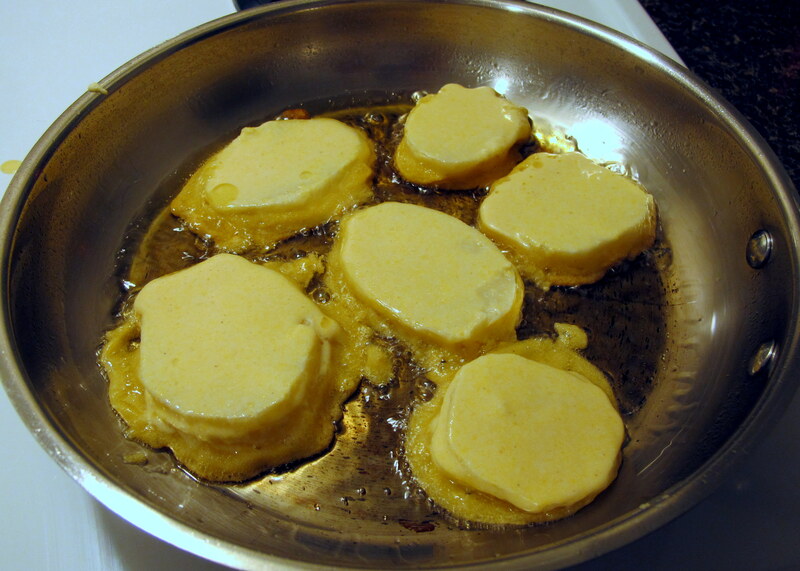 Fry for 3-4 minutes on each side, until the batter has turned a crispy golden brown. The potatoes are already cooked from being boiled earlier, so this frying just needs to cook the batter and re-heat the potato inside. Place the finished potato cakes onto a plate covered with paper toweling, or a cooling rack over paper toweling if you have one. Fish and chips (which includes potato cakes) are traditionally wrapped in butcher’s paper (even more traditionally, in newspaper), which will soak up excess oil from the cooking process – however, the cooling rack does a better job of this. If you are not serving them at this point, you can either refrigerate or freeze them and then fry or bake to reheat later on. If you are going to freeze them, do so on a chopping board for at least 2 hours before you stack them on top of each other in a container. Serve with a fructose friendly condiment such as a tomato sauce that you can tolerate, the spiced capsicum dip on this blog, or a tartar sauce. They (of course) would go well with some fish and chips – and the batter works well on fish, too. I always serve a salad with these… I suppose it makes me feel less guilty for eating deep fried foods; but then again, I don’t make them very often for this reason. On that note 🙂 enjoy! This entry was posted in Australian Cuisine, Dinner / Mains, Vegetarian or Vegan Entrees or Sides, Vegetarian or Vegan Mains and tagged appetiser, Aussie, Australia, dinner, entree, fish and chips, fish n' chips, FODMAPS, food, fructose friendly, fructose malabsorption, gluten free, home-cooked, homemade, low fructose, potato cake, potato scallop, Seattle, vegan, vegetarian. Bookmark the permalink. Delicious! Callum loved them. I think the genius in your recipe is the technique. No floating bits of batter in the oil that you have to fish out. I’m going to try this with chick pea flour when I next get some. Sounds good. I am planning on trying amaranth and sorghum flours when my current KA flour mix is done, because they’re apparently a great mix. I don’t know what their flavours are like, though, so I might throw in some white rice flour as well. I’m sorry that you don’t have anything nice to say about a recipe that you’ve never tried but every Aussie friend I have in the US, as well as a few Americans, have tried these and thoroughly enjoyed them. I wish I could eat wheat flour but, seeing as I can’t, I have created an approximation for myself to enjoy, which I then shared with people here. What you described is essentially what I’ve done here, except the batter uses a GF flour blend, rather than normal wheat flour. I actually prefer these to the potato cakes I used to buy from the local fish and chip shop back home – as they are freshly made, they’re crispier and you can taste the potato’s texture. Can you make these without the cornmeal, please, because I am extremely sensitive to corn in any form? Hi Natty, My name is Alicia and I live in a suburb outside of Chicago, Illinois. I was thrilled to find your website! I originally started looking for Aussie potato cakes recipe because we are doing a Holiday Potluck Luncheon “Pick a Country” to try different recipes from all over the world. I picked Australia because I have relatives in Sidney that I never met and it is one place that is on my bucket list of places to visit. Then I read that you have gluten free recipes which I am always looking for because my son was diagnosed with celiac disease at the age of 16 (he is 19 now). Thank you!